Has the suspense been killing you? Have you been staying up at night wondering if I went with white or green? :) Well I put in some over time decorating hours this past weekend and the chairs are now done! Last Friday I posted pics of these thrift store chairs in a rather sad state. I'm very happy with them! Such a great shot of color and it's such a happy green. I went with Lemongrass by Behr at Home Depot. 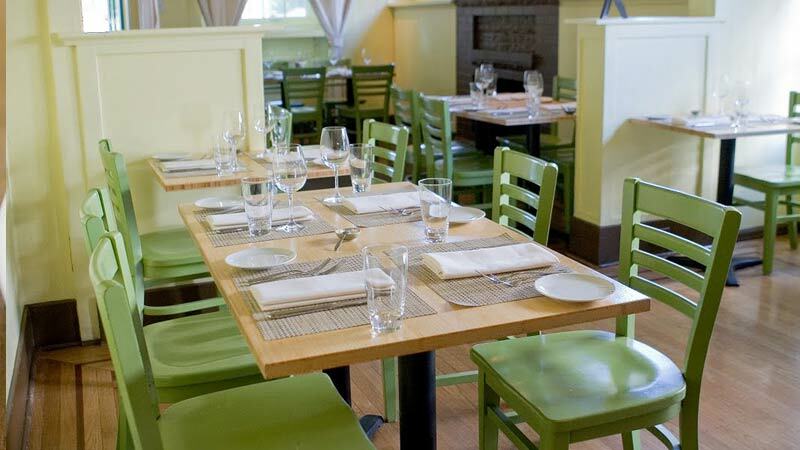 ﻿It's funny, I went to this restaurant last year and the food was good, but what really stuck with me, was how much I loved their lovely green chairs. Clearly, you know which of my 5 senses are more attuned. I'll be sharing more pics tomorrow documenting the process and some of the tricks I picked up while painting. Last, but certainly not least, thank you so much to everyone who gave me feedback through a comment, email, text. It was so fun to hear from so many of you! Green was by far the most popular choice and it gave me the confidence to go for it. Painting with bold colors is scary, even for me! I think that's the beauty of developing a great online community through blogging, being able to help and encourage each other to solve problems and live better. The green color you picked looks great! Love! And they look brand-spankin'-new!